In 2017, DJ Khaled has plenty to be grateful for: He is coming off quite possibly the biggest album of his career with 2016’s Major Key. His career as an album DJ is now going on eleven years since the release of his debut in 2006, which is a feat in and of itself when you consider how much music has changed during that time. Most importantly, the birth of his son occurred in the past year. It is an event that has been almost impossible to ignore. All of that leads us to Grateful, DJ Khaled’s biggest, longest, most important album to date which was executive produced by his aforementioned 8-month-old son Asahd. Coming in at a daunting 23 songs, it is clear that Khaled is pulling out all the stops and making calls to almost every artist in his rolodex for this album. The only question is would listeners be as grateful as Khaled after listening to the nearly hour and a half effort? Khaled reiterates just how grateful he is on the title track and opener ‘I’m So Grateful’ which features Sizzla crooning on the first half and Khaled delivering motivational words on the second. Khaled has a knack for making the intros and outros of his albums nothing like what happens in between. Grateful is no different as Khaled spends the next 16 minutes stacking the four previously released singles one after another. There’s the Beyoncé and JAY-Z joint effort ‘Shining’ that finds Beyoncé with an undeniable swagger and JAY-Z delivering a plethora of dad raps. He then serves up the underwhelming ‘To The Max’, where it seems as if only half of the Drake vocals came in this time. The song is a grower after multiple listens, but with two artists that have such a storied track record of collaborations, ‘Max’ lands somewhere near the bottom. Following that is the ‘Maria Maria’ sampling ‘Wild Thoughts’ that features the long-awaited Rihanna guest vocals. It’s another surefire hit that Khaled can add to his belt, proving that great things do indeed come to those who wait. Bryson Tiller’s contribution to the record doesn’t add much, but also won’t hinder its hit potential. Finally, we arrive at ‘I’m the One’, which is already the biggest single of Khaled’s career. The posse cut, which features Justin Bieber, Chance the Rapper, Quavo and Lil Wayne, is an infectious summer jam that will continue to heat up the radio waves long after summer has come to an end. ‘I’m the One’ ends the back to back to back to back singles on the album and begins the stretch of songs that listeners have yet to hear. The sequencing is already something that Khaled (or Asahd) should work on going forward as hearing one new song in the first twenty minutes of runtime is a bit of a chore. Grateful is a long album if that hasn’t been reiterated enough already. Khaled is not necessarily known for creating conceptual and concise bodies of work, so judging this in the same light as we would a solo act is difficult. The fact that there are still 18 songs remaining after the first stretch of songs is still hard to gloss over without feeling overwhelmed. Khaled decides to kick off the new portion of the album with the first two of a total four collaborations with Travis Scott. ‘On Everything’ features lazy vocals from Scott on the hook and a memorable Big Sean verse where he may have taken a few slight jabs back at Kendrick. The second is the Travis and Nas connection ‘It’s Secured’. Nas impressed and excited fans with his ‘Nas Album Done’ contribution to Khaled’s last album. A year later and there’s still no Nas album to speak of, just another verse on a Khaled album. However interesting this collaboration may have looked on paper, it’s equally as disappointing in reality. The song is mixed poorly, contains a nearly unbearable hook, and off beat Nas verses. Sometimes these unorthodox collaborations work, but this is a great example of one that should have been left on the cutting room floor. In stark contrast to ‘It’s Secured’ is the Alicia Keys and Nicki Minaj assisted ‘Nobody’. Keys delivers beautiful vocals and Nicki refrains from using her Barbie voice or spitting any bars that make you shake your head. She does have a line that insinuates that her single ‘No Frauds’ was a smash hit, which only makes you wonder which chart she is looking at. Other than that, ‘Nobody’ is one of the stronger moments on the album. The second Chance the Rapper feature on Grateful is one of the most divisive moments on the album. As a fan of the Chance, ‘I Love You So Much’ makes perfect sense. Like Khaled, he celebrated the birth of his daughter recently and this song is undoubtedly an ode to their respective children. It accomplishes that well but still sticks out like a sore thumb in the context of the album. It would be much better served in Chance and Khaled’s personal vaults for their children to listen to whenever they please. A song that recites the ABC’s as a teaching tool has a time and a place and alongside songs such as ‘That Range Rover Came with Steps’ is not it. One of the more interesting connections happens at the halfway point of the album. Calvin Harris, who is dabbling in star studded posse cuts himself this year, teams up with Khaled, Travis Scott and Jeremih for ‘Don’t Quit’. Harris, who has an album releasing a week after Khaled’s, brings his summertime breeze to create one of best tracks on the album. The second half of the project continues the mixed bag of the first. There are a few songs that could fit on any of Khaled’s previous nine albums. ‘Iced Out My Arms’ brings the usual star-studded line up. It’s a true Atlanta pairing that connects the old and the new. T.I. and Future ride shotgun alongside Migos and 21 Savage. The most interesting part of ‘Iced’ is how T.I. can still sound at home next to anyone you place him with. ‘I Can’t Even Lie’ and ‘Whatever’ are the other Future contributions and both result in overstuffed and unnecessary additions. The same can be said for the Migos assisted ‘Major Bag Alert’, which ends up sounding like a lackluster leftover from Culture. Where Grateful is at its best is when it keeps it simple. The first example is Pusha T spitting grimy bars over a soul sample with Jadakiss. Sometimes Khaled overthinks his collaborations when he could just call two artists that people want to hear together and keep it at that. ‘Good Man’ has a menacing beat with even scarier bars. Fans clamoring for a Pusha T album will only grow more impatient after hearing him here. ‘Billy Ocean’ follows the same formula as ‘Good Man’. Fat Joe and Raekwon prove that they haven’t missed a step as they exchange bars over the light keys. ‘Down For Life’ is one of the best excessive collaborations the album has to offer. Driven by a memorable PARTYNEXTDOOR chorus, guest features Travis Scott, Future, Rick Ross and Kodak Black all sound more comfortable here than on any of their other contributions to the album. The most surprising moment of Grateful is that its best song isn’t a collaboration at all. The ‘Interlude’ by Belly is just two minutes of bars over an angelic beat. Of all the songs included on Grateful, it’s a shame that this is the one he decided to make an interlude. Khaled seems to become a bigger star with every year that passes and his trajectory looks to continue if this year is any indication. Grateful teaches a few valuable lessons about excess. Khaled seems to think that the more people he crams onto his albums, the better they will be. He also thinks that the more he tells us his singles or albums are going to be epic, the more we’ll believe him. In the process, he’s actually creating expectations that are almost impossible reach. Khaled isn’t lying when he tells us that it’s an event every time he releases something. In the past two years, he has delivered bigger singles, bigger videos, bigger albums and somehow in the midst of all that success, bigger disappointment. 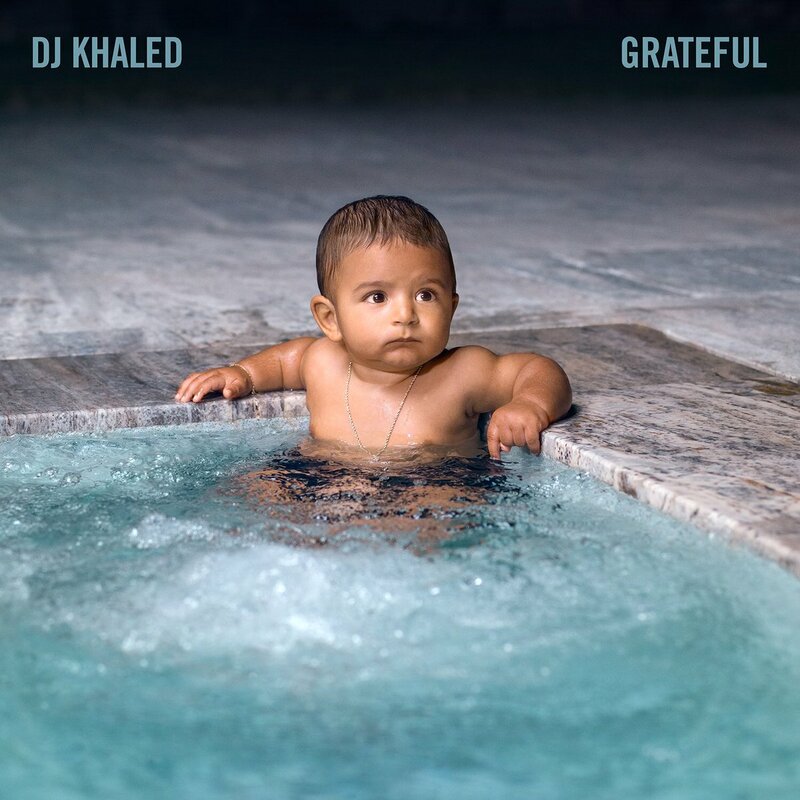 Khaled told us that his infant son Executive Produced Grateful and after listening through all the clutter and filler, you might just believe him. It’s an album that plays like a brainstorming session where nothing was erased. But through it all, Khaled has lasted an unprecedented decade in this cutthroat industry due to his infectious positivity, business savvy and hitmaking ability. The crazy thing is, there’s almost no doubt that he’ll make it another 10 years because of those same things. It’s been amazing to watch Khaled reach the heights he has in 2017. In 2018, he should realize that sometimes less can be more, but who are we kidding? He wouldn’t be DJ Khaled if he did.